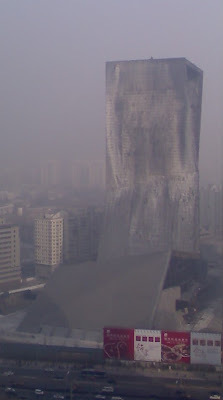 Some picture of the aftermath and about the deceased firefighter's story on sohu. I was at a friend's apartment watching firework. As you probably know, fireworks are uninterrupted form all directions during Yuan Xiao in Beijing. 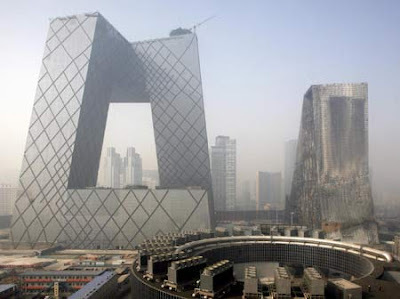 However, those from the CCTV complex trumps all, they are 3 times bigger and 3 times higher! The traffic on East 3rd Ring soon went to a halt as drivers stops by the roadside to watch this spectacular show. It started as splendid firework, unfortunately the wrong place was chosen for the show. 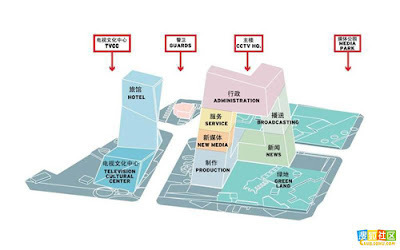 The space between the 2 tower in the CCTV construction site (where the fireworks were set off) was just not open enough and fireballs often bounces on the glass wall of the "lesser tower"/"tower II"/Annex (the full name for that building is actually TVCC - TV Culture Center, which will host the studio, concert hall and the Mandarin Oriental Hotel). I got a bit worried watching that. About 20 minutes into the show (about 820-825pm), a small fire was seen on the top of the tower, apparently due to one of the fireballs from the firework show. OMG! The firework shot to about 50-60 stories high, about 5 stories higher than the lesser tower but lower than the top of the main tower (the assymmetric boxer tower 大裤衩). 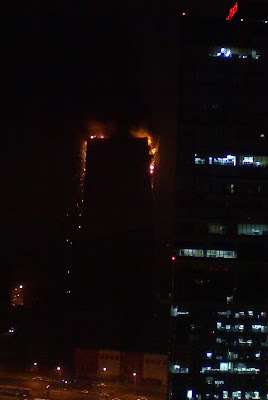 Fire trucks arrived in about 5-10 minutes, but it seems that they were unable to reach the top of the building. Had there been helicopter with water bomb, the fire could have been put out easier at that time. Otherwise, if there was water supply to the roof, things would also be easier. Unfortunately, it seems the fire at the roof was not (or could not be) taken care of. 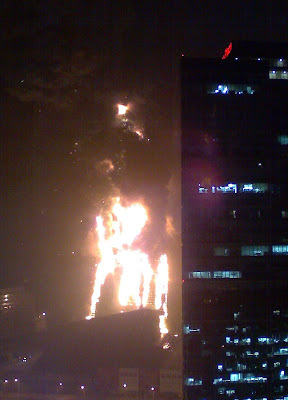 By about 20:50 the fire lost controls, the roof started to collapse and starts to spread to lower floors. Then I knew it was over for this beautiful building. What a shame. At some point I wooried that there might be a WTC style collapse, especially when there were at least two major explosion between 2100 and 2200. There would be very strict rules on fireworks next year -- need to be set on completely open space, not close to any building. This is what it should have been. Instead, many people did it on the roadside, or on the road, or just next to the buildings. p.s. the fire seems to be under control by 2230pm, about 2 hours after it was started. p.s.2. 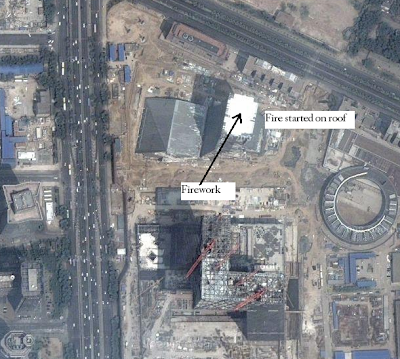 the fire was surely started by one of the fireballs from the firework show (see illustration on google satellite photo above). and it was almost certain that it was CCTV internal people who did the firework show, since those were the most expensive type of firework not seen anywhere else in Beijing tonight. I expect someone within CCTV will be punished. p.s.3. you may have seen some photo with white spots on top of the fire, that was taken around the time the explosions happened. p.s.4 The TVCC is 44 stories and 159 meter tall, the CCTV main (asymmetric) building is 234 meter tall.the firework shot to around 180-200 meters and it was much closer to TVCC. The whole complex cost 5bn RMB to build, which makes the TVCC perhaps around 1bn RMB, not including equipments inside, which was said to cost in the billions. Very nice catch of the fire. Hopefuly no one was hurt. Thanks for your latest news. You should be a reporter.It's starange that CCTV or BTV news channels no live broadcast about this big fire and ironically it's happened in CCTV! I've been seeing people crazily set fireworks these days and couldn't wonder if they ever think about it might be dangerous when so many buildings around , cars drive by ? People in China are getting rich but they need some education..